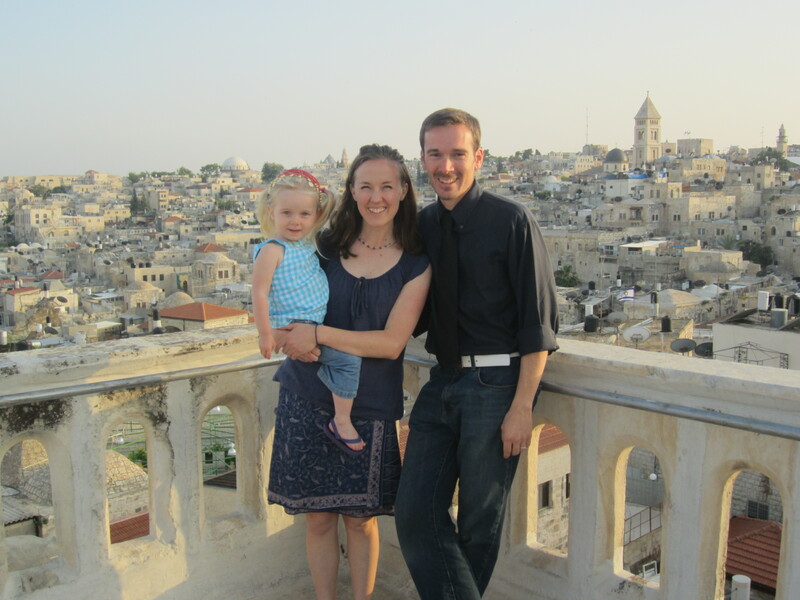 My wife and I celebrated our 10 years of marriage this past May by visiting Israel and the West Bank. It was a two and a half week trip and we have a daughter who is two. We decided that we did not want to be away from her for that long of a trip, so we brought her along. 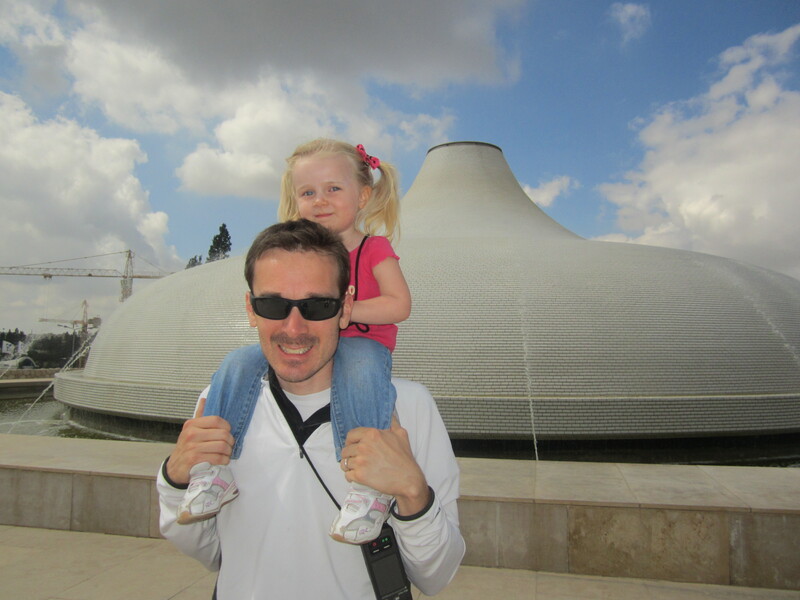 We’re so glad we did, because visiting Israel with a toddler is an adventure that is memorable and well worth it. There are some unique challenges, but we would do it all over again in a heartbeat. First of all, this was a self-made trip/tour. We did not go with a large tour group. We bought our tickets from IAD to TLV, stayed the first week in Jerusalem and the rest of the trip driving around the country in a rental car. On the roof of our first accommodation for the trip: the Ecce Homo Convent and Guest House in the Muslim Quarter of the Old City of Jerusalem. A lion statue in the Jewish Quarter of the Old City. 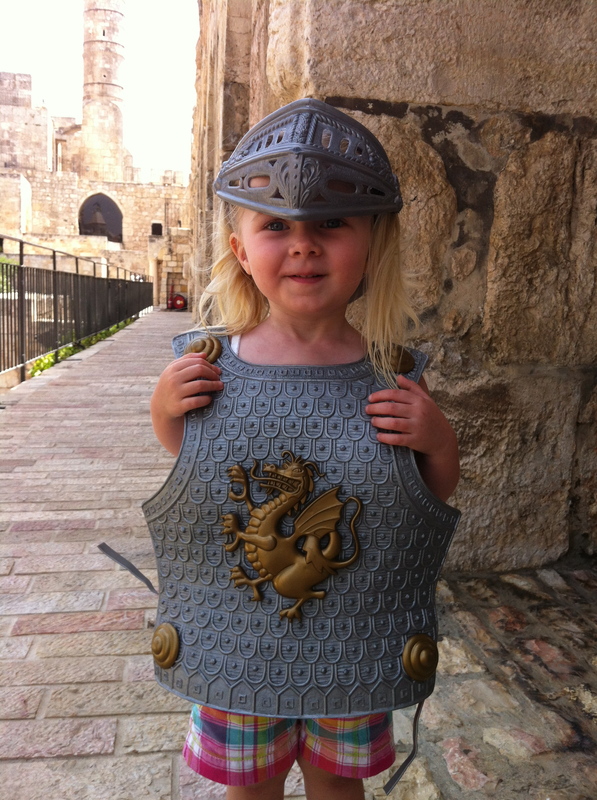 Dressing up at The Citadel (David’s Tower) next to Jaffa Gate in the Old City of Jerusalem. At the beach in Haifa. 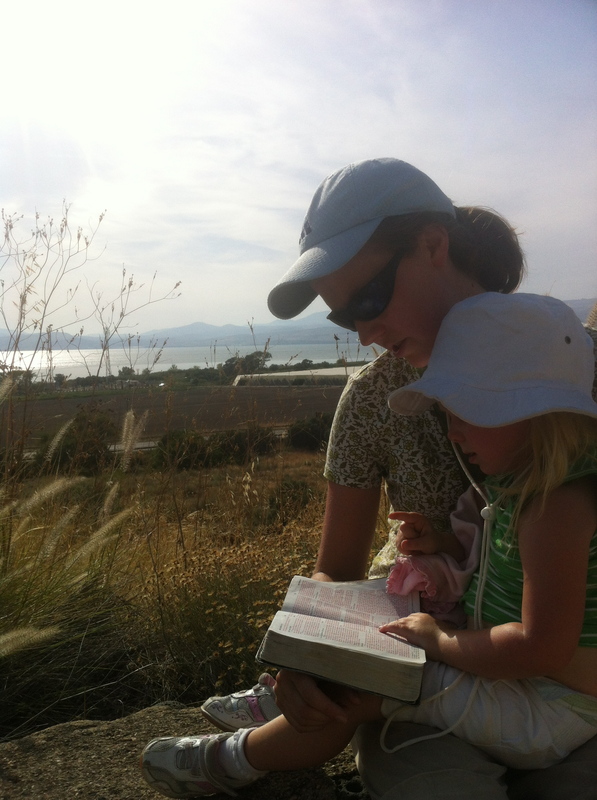 Reading Jesus’ Sermon on the Mount overlooking the Sea of Galilee. 1. In-flight movies are your best friend on long-haul flights. We try not to let our toddler watch too much media (we don’t even own a television). But those little monitors on the transatlantic flights are a dream. Our daughter watched Lady and the Tramp three times in a row. 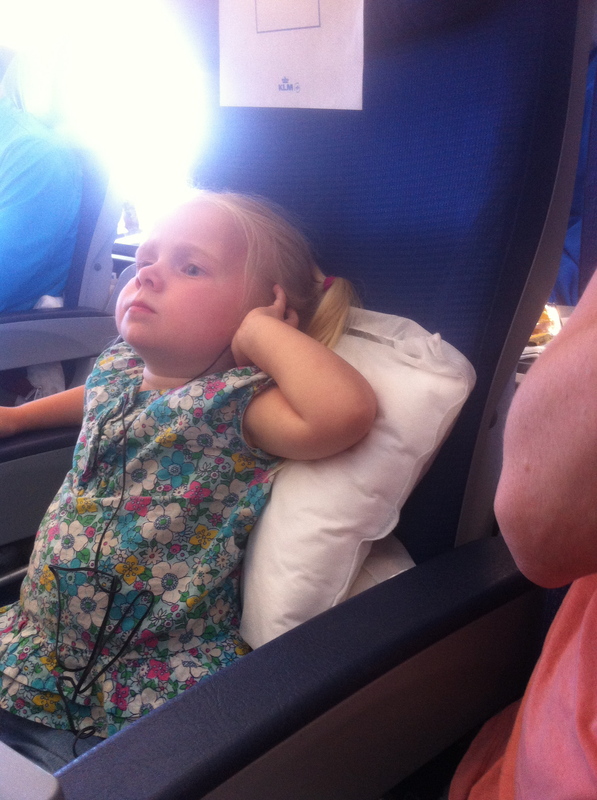 The flight attendants also gave her a little bag of toys and crayons. Of course, we also brought toys and books, but the movies were the real winner. It kept us sane and prevented an already uncomfortable situation from turning chaotic. 2. Bring a stroller AND an ergo carrier/sling/wrap. That’s what we did – and it worked. We also have a frame hiker backpack, but that is a little bulky, so we left that at home in the States. The Ergo carrier did the same trick (our daughter is on the lighter weight of her age) and was a lot easier to travel with. 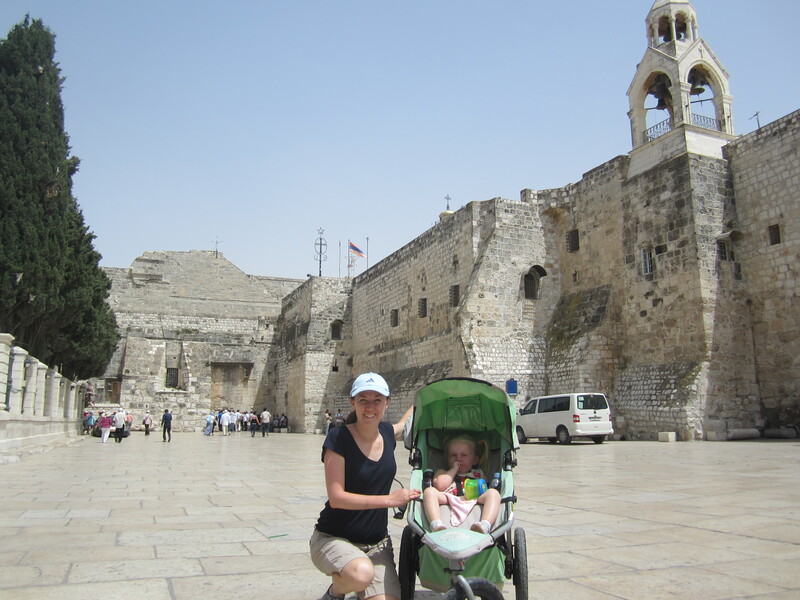 That way, when we went out for the day on foot (often in Jerusalem), we had the choice of using the carrier when the terrain was bumpy (as it is in the Old City and around the valleys) and the stroller when we walked around the New City. We just planned out our days so that we left the stroller in our room when we knew we were going to do mostly Old City and archaeological sites for the day. 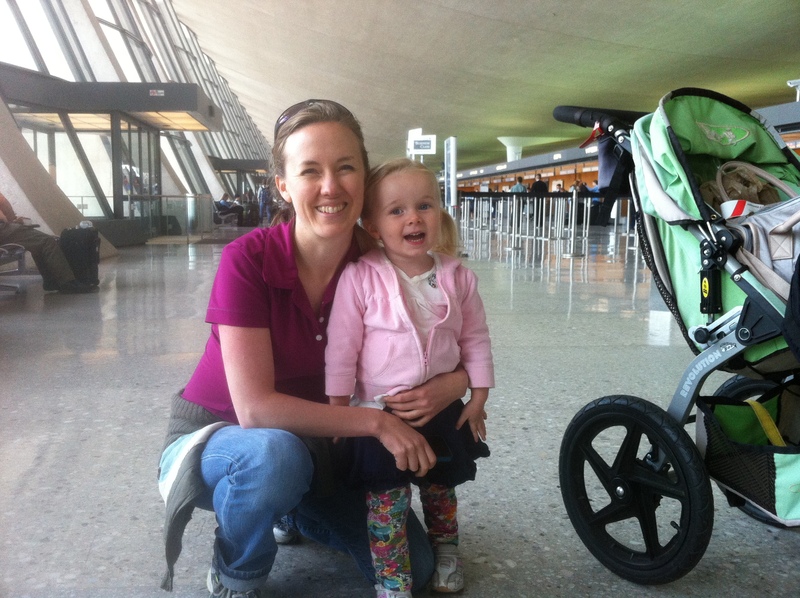 At Dulles airport before checking in for a long trip! 3. 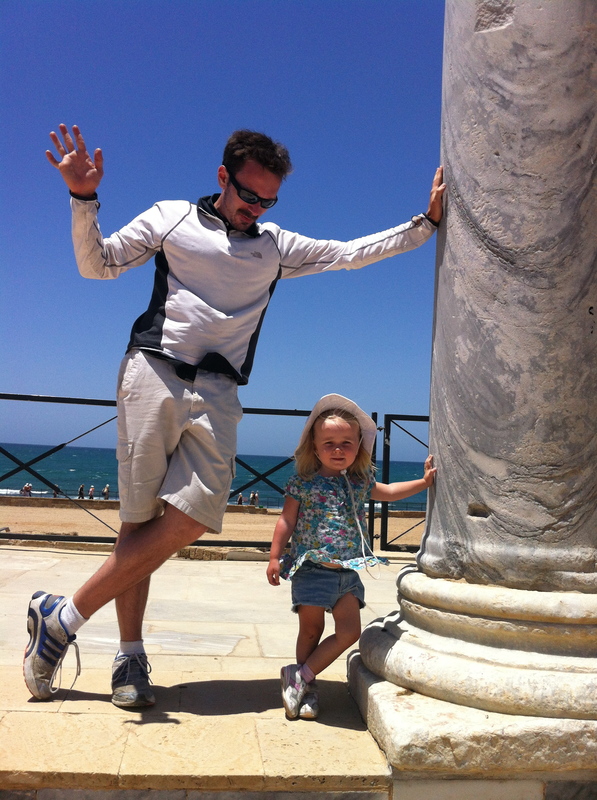 The financial cost of bringing along a toddler is next to nothing (after paying for the plane ticket, of course). She was over two, so we paid for her plane ticket. But after that, she cost us about zero dollars or shekels. She was free at all museums, tourist sites, public transport, and even most restaurants (because the food comes out Mediterranean style – lots of generous plates for the table to share). She was also no extra charge at all of our lodging situations (which were convents, guest houses, and a bed and breakfast). Standing guard at Nimrod’s Fortress in the Golan Heights. 4. Speaking of lodging, we stayed at five different places over the course of the trip (Ecce Homo Convent in Jerusalem, The Bridgittine Sisters in East Jerusalem, The Masada Guest House at Masada, The Quiet Place B&B in Tiberias, and Stella Maris in Haifa). All five had something comfortable for our daughter, whether a folding crib or a spare mattress that we could lay on the floor – all for no extra cost. We simply checked ahead of time and made sure they had the crib or mattress available. 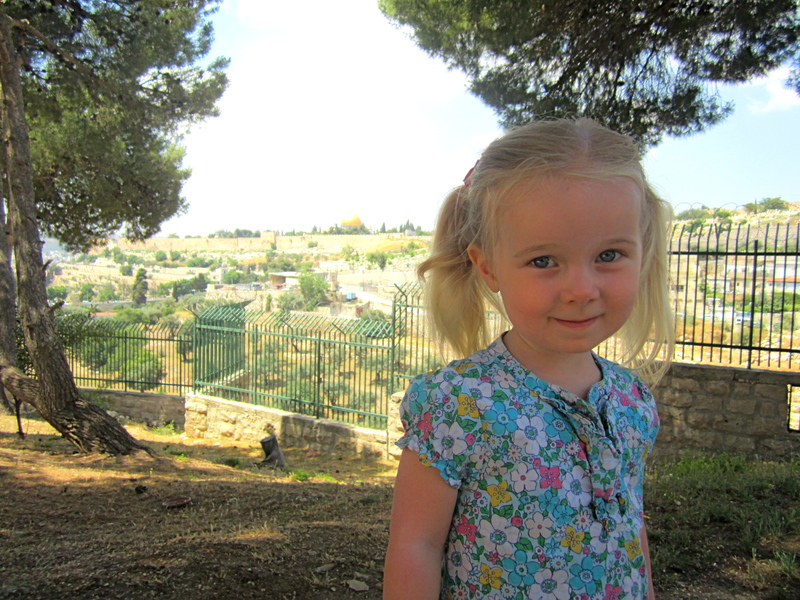 On the front lawn of the Bridgittine Sisters Monastery on the Mount of Olives overlooking the Old City of Jerusalem. 5. In terms of safety and security, we had no problems. Like any large city around the world, you need to keep an aware head on your shoulders after dark, but we weren’t out after dark with our daughter much anyway. 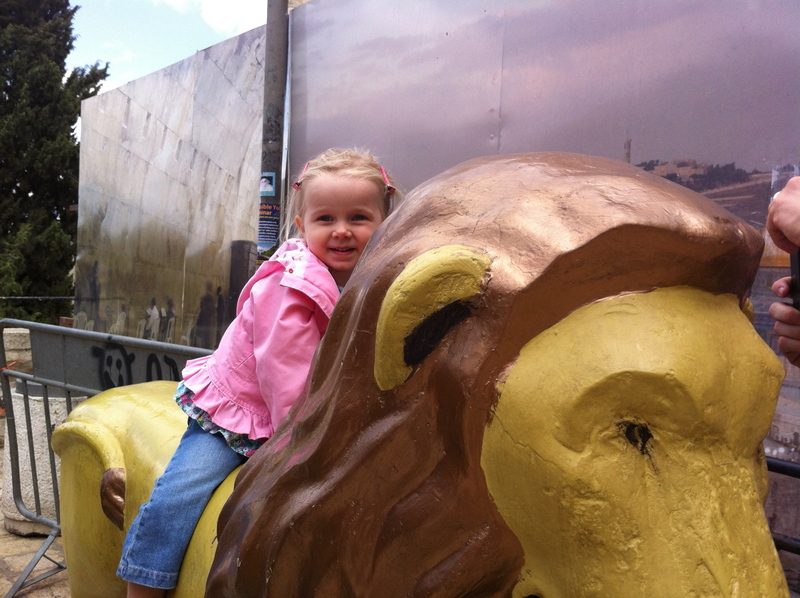 We felt extremely safe the entire time we were in Israel AND the West Bank. The vast majority of people on both sides of that 1967-border are very friendly and look out for guests and visitors. It helps if you smile and don’t look scared all the time. Israel has some of the best defense and security systems in the world. And though you wouldn’t think it, Israel’s murder rate is LESS THAN HALF that of the USA. 6. Our daughter also scored lots of bonus trinkets from friendly shopkeepers or restauranteurs. Locals loved meeting her and interacting with her (more so than in the USA). That made us feel very welcome and comfortable in the country. 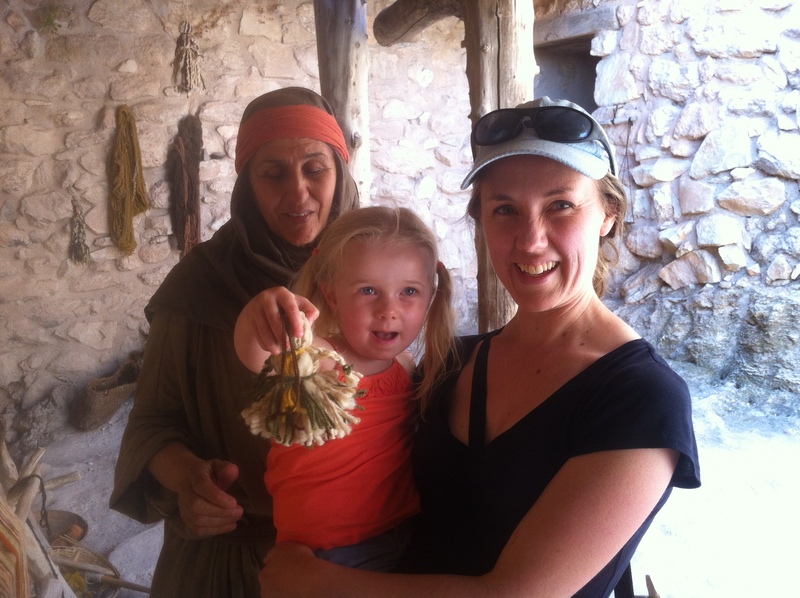 A yarn doll from “Mary” at the Nazareth Village. 7. 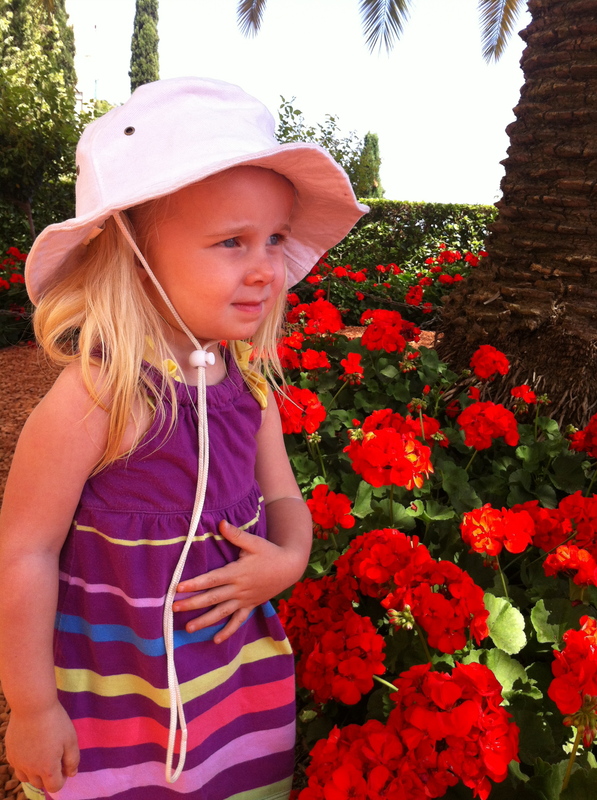 One of the most meaningful aspects of bringing her along was watching her take in the entire experience. I don’t think this will escape her memory as she grows older. We have pictures and videos, and she even talks about things she did in Israel (3 months later). Some friends of ours gave us some kids books about Israel as a welcome home gift. 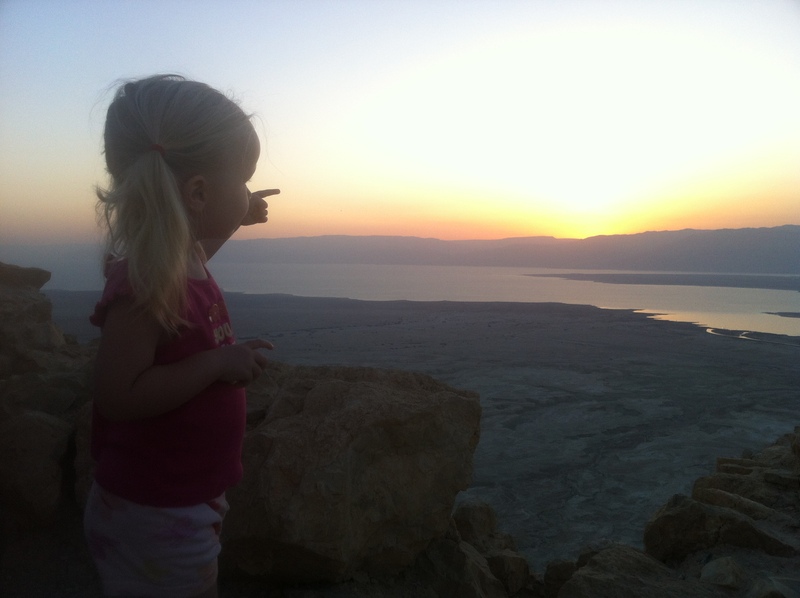 She loves reading those and recalling her trips to Masada, The Dead Sea, The Sea of Galilee, Haifa, and Jerusalem. 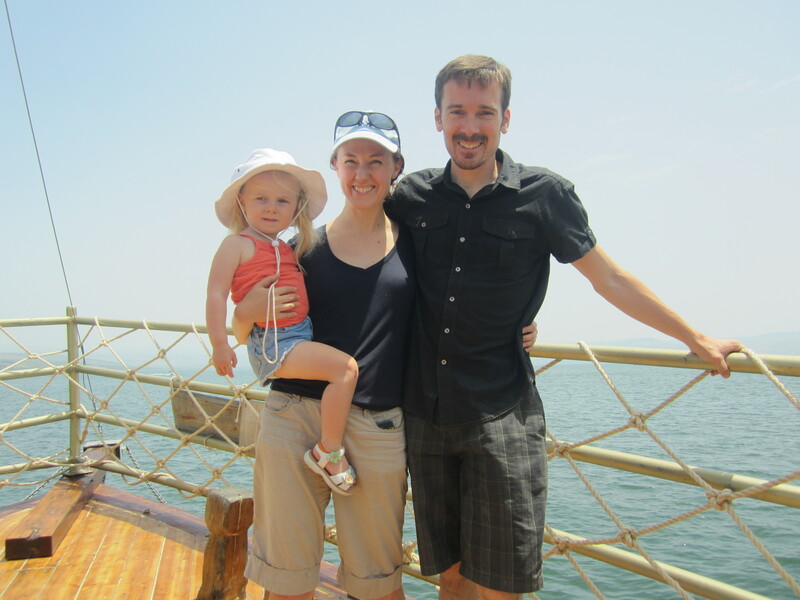 On the Sea of Galilee. The gardens at the Ba’hai Temple in Haifa. 8. 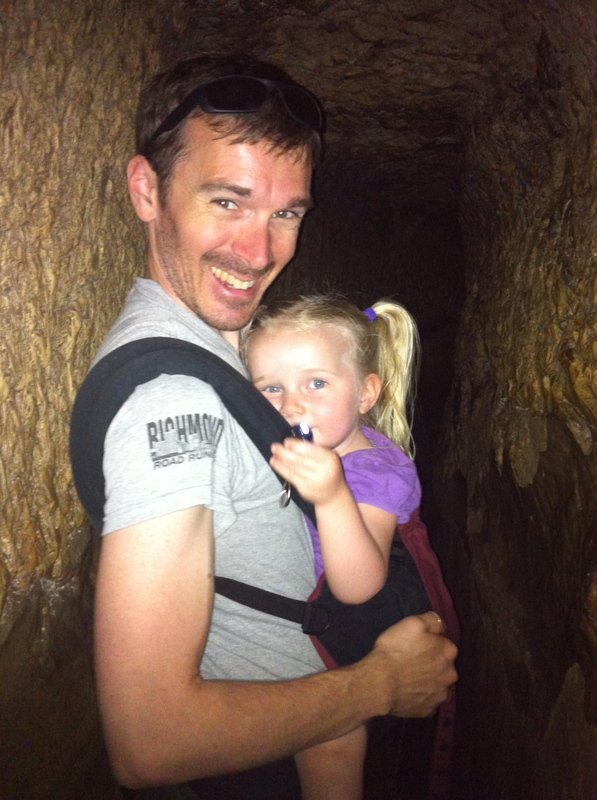 We did go through Hezekiah’s tunnel with her (in the Ergo carrier). It was a little nerve-racking at first (the water came up to my waist at one point and the walls of the tunnel are VERY narrow – not to mention pitch darkness). But we finally got her a working flashlight and that calmed everyone down. We used the flashlights on our phones since we didn’t bring our own battery flashlights. It was an adventure, but if I did it again, I’d probably pass on the toddler-on-your-belly-through-Hezekiah’s-tunnel thing. 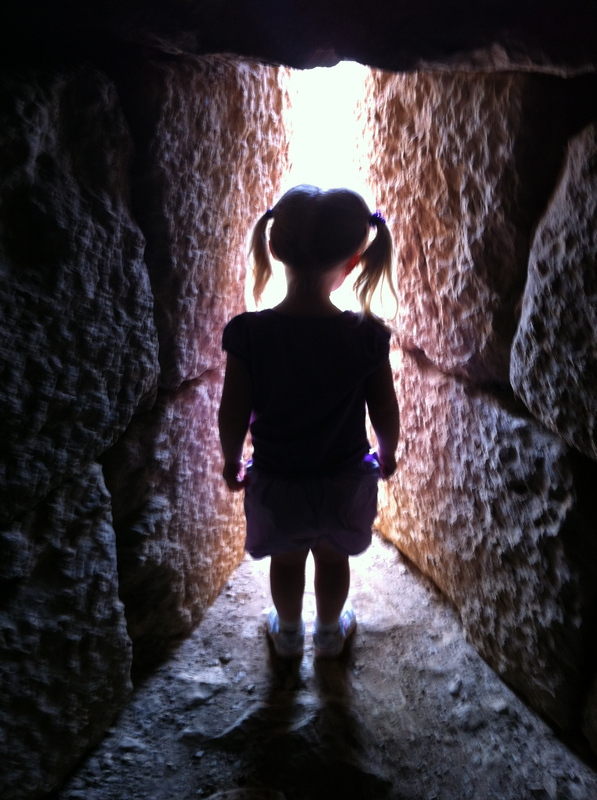 Hezekiah’s tunnel with a toddler. 9. 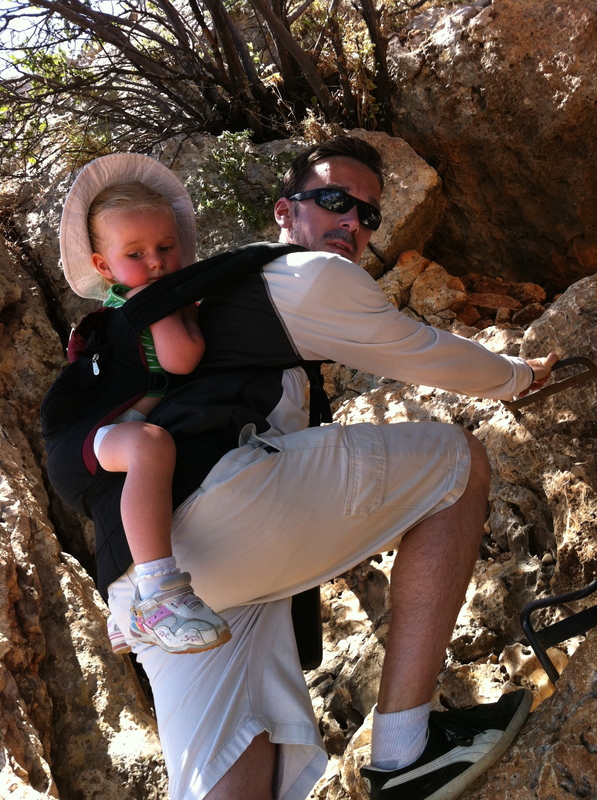 We also hiked the snake path to the top of Masasda at 4:30 in the morning with our daughter on my back in the Ergo. That was a wonderful experience – especially when I was passing other hikers and they made comments to me like, “show off….” What I do regret is taking the snake path back down after 2 hours on top of Masada. We should have just splurged and rode the cable car down. Either way, there is a huge complimentary brunch waiting for you at the Masada Guest House if you stayed there the night before. Masada at sunrise was well worth it. 10. Naps. So we were bad parents and didn’t always lay her down for a nap every afternoon. Hey, we were on the other side of the world and wanted to make the most of our time. 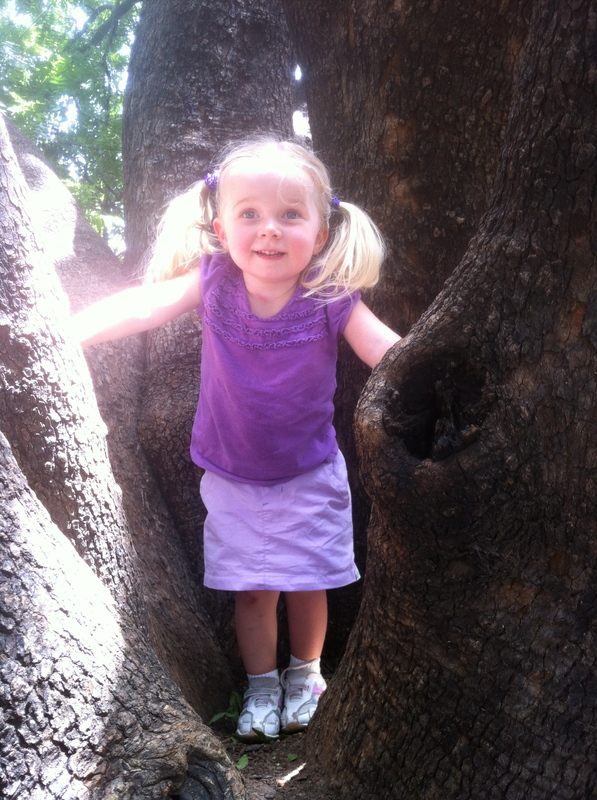 Of course we were attune to her needs and made sure she was happy and healthy. But on our last full day in Haifa (towards the end of the trip), we laid her down for a nap in the convent around 2pm. We thought we could have a nice family outing that night after her nap. But that didn’t happen. Our daughter didn’t wake up until 8am the next day! That was her way of saying, “If you’re not going to give me a full daily nap on this trip, I’m just going to make up for it by sleeping for 18 straight hours!” She was bushed – and so were we. We just chilled in the room that evening and rested up before heading to a big day in Caesarea the next day. 11. Car seat. We rented from Eldan Car Rental, which was a great choice in my opinion (except returning the car to the Eldan lot at TLV was a little confusing due to some detour signage). We were able to add a car seat to the rental for some $30 extra, which was well worth not lugging a car seat with us halfway around the world. 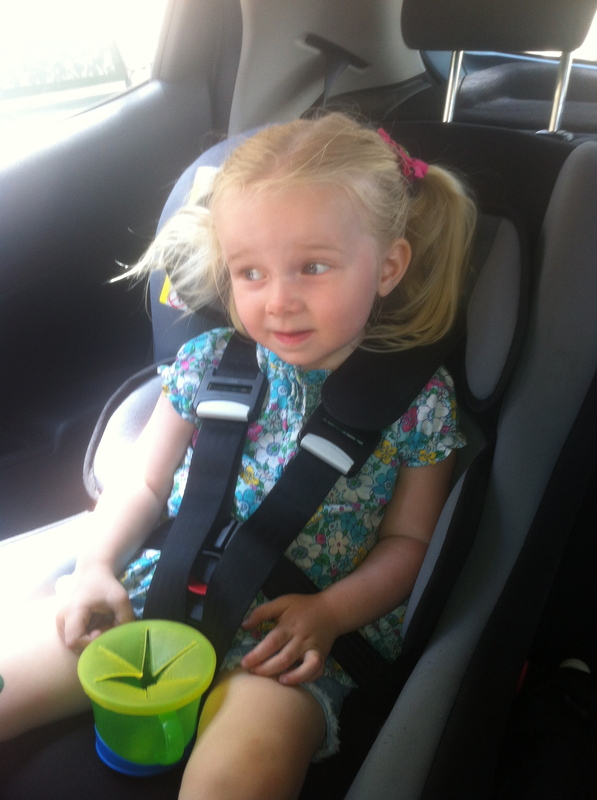 The car seat was only about $30 extra on the whole week of a car rental. 12. Sun and Water. We brought plenty of water and water bottles with us everywhere. One of the shopkeepers in Jerusalem told us that a trick some people use with toddlers who don’t drink enough water is to mix in some juice or powder drink mixes. We indeed tried that and I think it helped her stay hydrated! As for the sun, we made sure she had sunblock and a head covering or a wrap for her body or the stroller when the sun was too much. 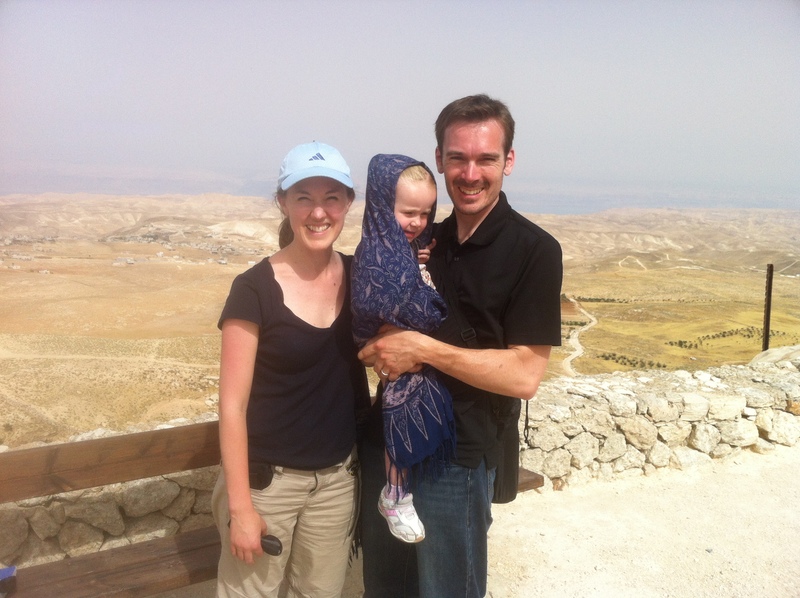 The wrap helped in the heat at Herodian. 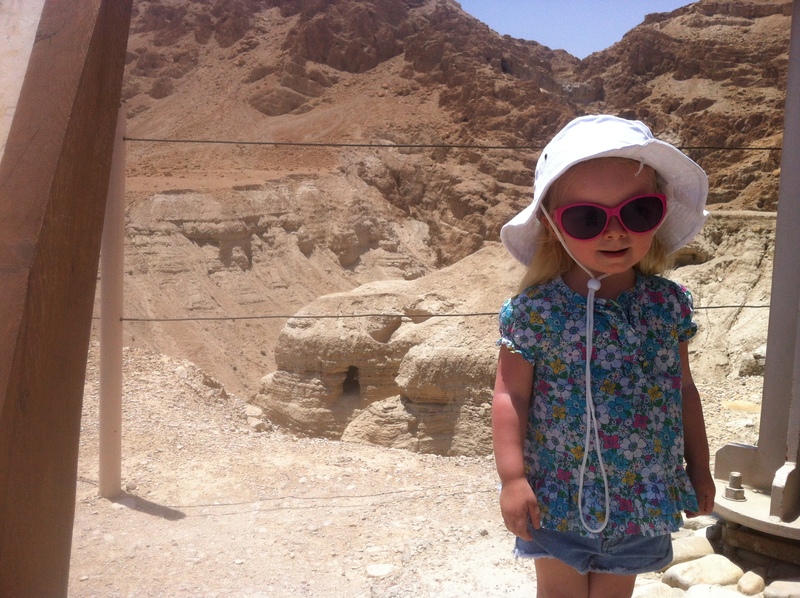 Our tour guide at Qumran. 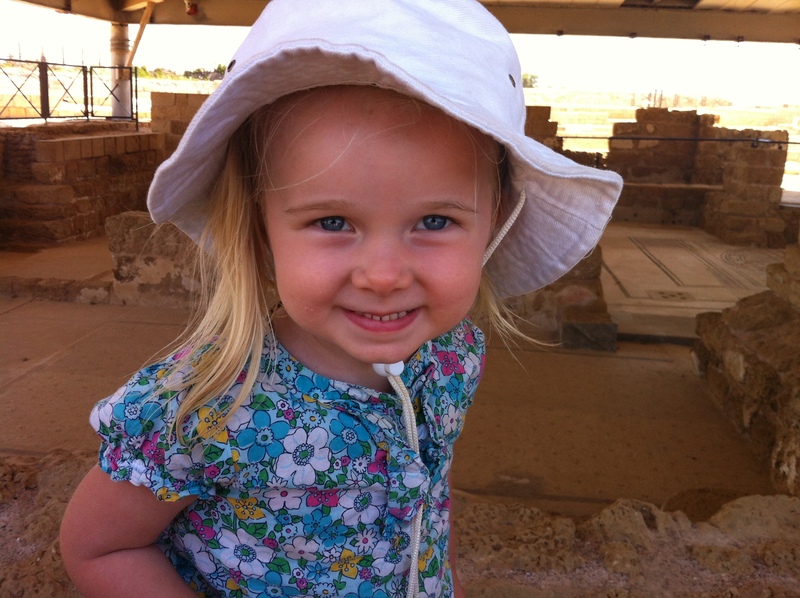 I hope this helps anyone out there considering taking a toddler to Israel. I say “do it!” We made lots of fun family memories and it was well worth every penny and every pound of weight on my back. One of my favorite pics from the trip. 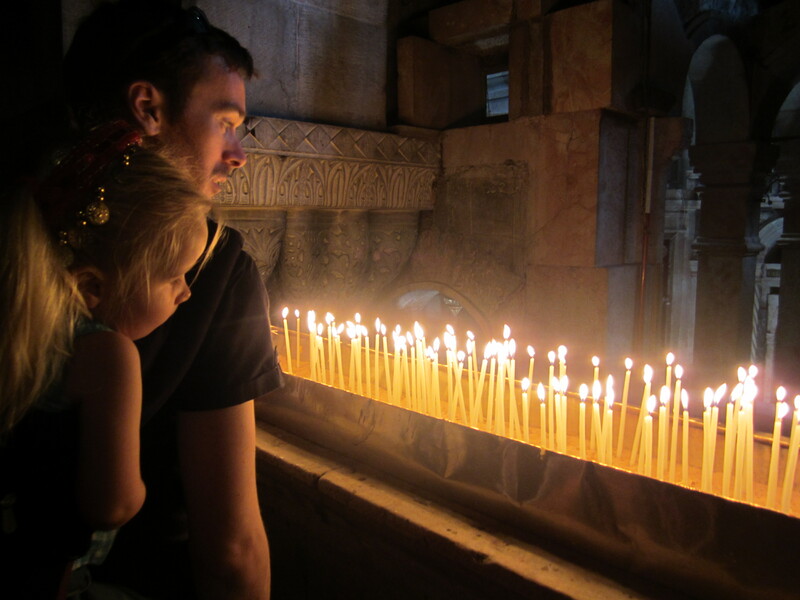 Looking at candles together in the Church of the Holy Sepulchre. What’s up everyone, it’s my first visit at this website, and article is really fruitful for me, keep up posting these articles. Sorry I’m just getting back to responding. Thank you so much for reading the post and for the kind comments. I’m so glad it was helpful to you and I hope your trip is/was wonderful! Thank you for sharing. 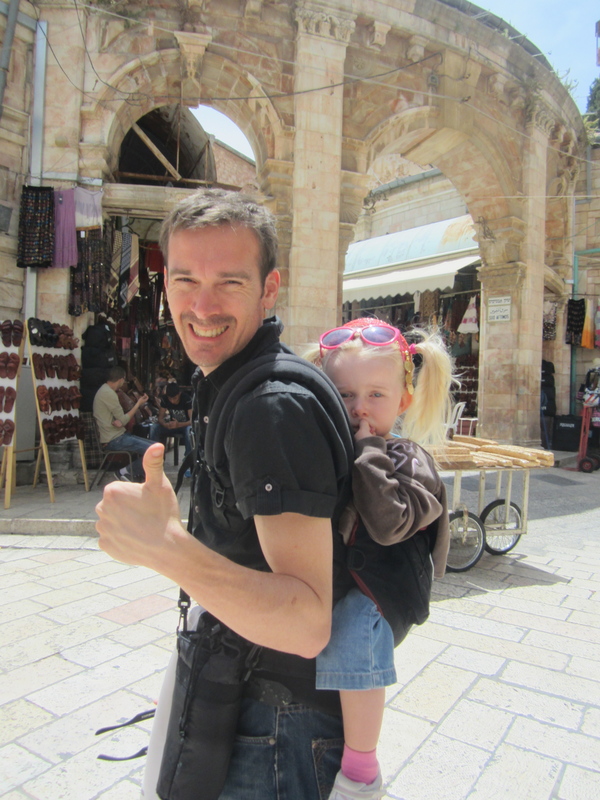 I know this was from a few years ago, but we recently had scheduled an Israel tour with our fellowship, but then today they told us that most of what was going to be done would not be child friendly. We started looking around for other options and came across this blog. Do you have information on how you booked all this and put together your itinerary? We have 4 small ones, youngest being just about your daughter’s age when the above trip happened. Thanks for stopping by! I can’t speak to doing it with four kids, but I’m certain it’s been done before and I’m sure you can make it happen. This was my second trip to Israel (I spent three months there studying abroad in college), so I felt confident about doing it on our own this time around. If you’re the adventurous type with a little travel experience already, you should be just fine. 2. We rented a car for the second half of the trip (everything non-Jerusalem) from Eldan Car Rental. They were good. It was just hard to find their return spot at the airport, that’s all. 3. 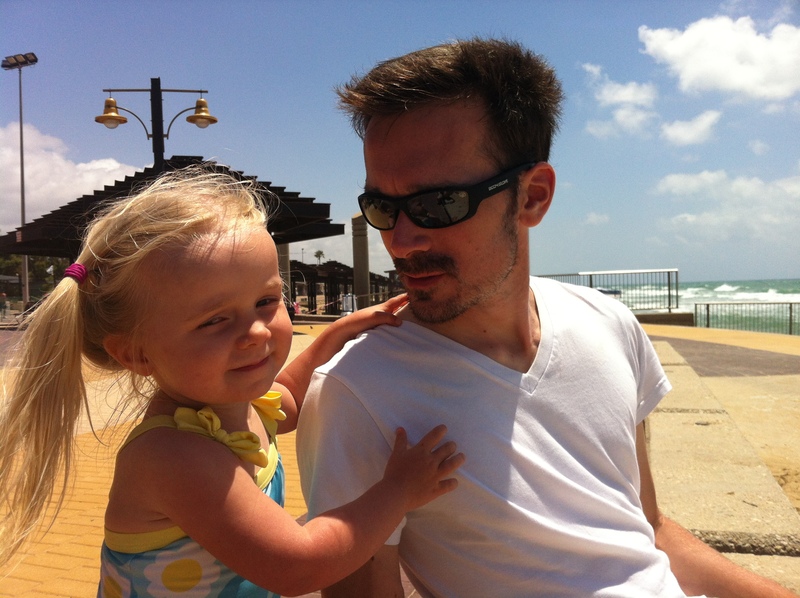 We flew from Washington DC to Tel Aviv (with Europe layovers) for $875 a ticket, which is pretty good for US to Israel. 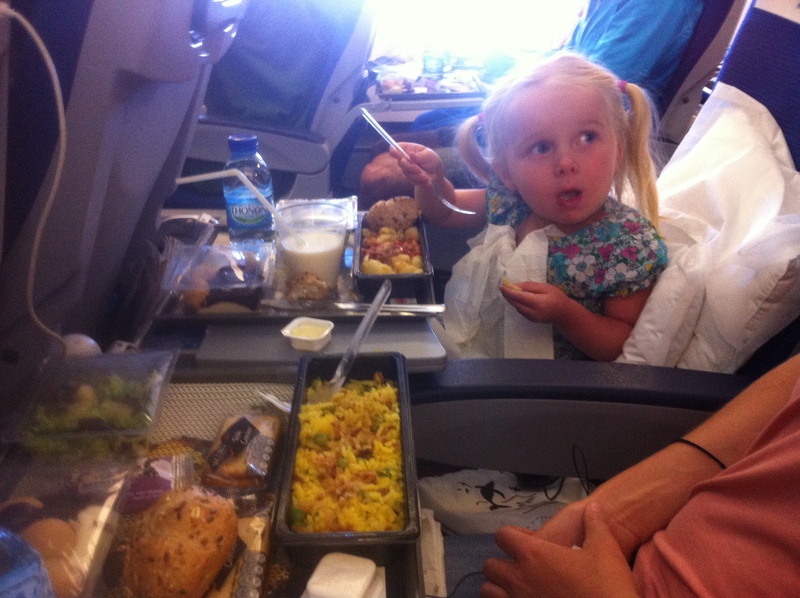 It was on KLM airlines (who is a Delta partner). 4. Passport and border control was easier than I thought getting in and out of the country, so don’t worry about that. 5. We felt extremely safe the whole time we were there. Israel is a very safe place for tourists. 6. The whole trip (airfare, lodging, meals, transportation, site-seeing, gifts and souvenirs, etc.) cost our family of three about $5,000, which I think was pretty good. Feel free to ask any other questions! Thank you so much for the reply! In my younger days, yes I would go wandering about. Never have been out of the country though. Did you book all this before hand or was it an as you went kind of thing? Did the rental cars have GPS? Or were you able to utilize a cell phone for that? Yes, we booked it all well ahead of time. If you’ve never been out of the country before, it might be good to go with an organized tour after all since those people are professionals at taking care of all the logistics for you. Everything above is just our story and we can’t guarantee it can be replicated easily. You might want to seek out a family of your size who has done this before. No matter how you do it, though, you’re going to have an extremely memorable and worthwhile experience! This is great Jesse! Very helpful. 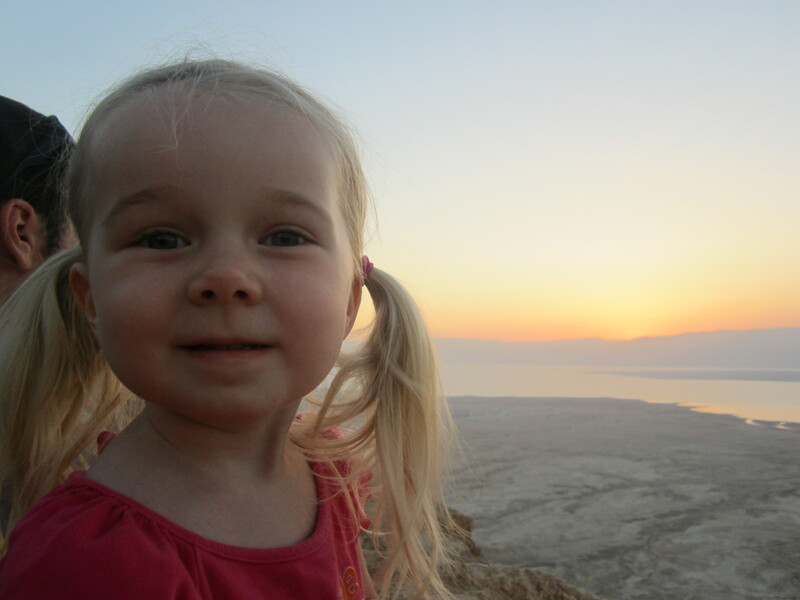 We are traveling as a family of 6 – including my 26-month old daughter, 60 year old parents, husband, and sister – to Israel over the Christmas break. 1. Did you do any farm visits on your trip? My dad is super-excited about farming technology in Israel and would like to visit some. And I am sure my daughter would be excited about it too. 2. Are children allowed in all museums? 3. Are most restaurants child friendly? Or do you recommend that we pick only the casual/fast food type? Rashi, thanks for stopping by. You’ll have a great time with all that family along! Unfortunately, we did not visit any farms. I don’t recall being turned away from any museums due to having a toddler, so I’m not aware of the ones that don’t allow children. There might be some, but each one is different, so you would have to just check each website before going. We also found our restaurants to be child friendly – casual and semi-formal ones. We didn’t eat in any of the super ritzy ones, and those might be more for older kids and adults. But I wouldn’t know because we didn’t go to them! Have a great trip. This is an old post so I don’t know if you will see it, but we were wondering, did you book with a tour guide for the whole time or just plan your own trip and short tours? If you used any tours, which ones? By the way, my husband studied at TEDS too. Leslie, thanks for stopping by! And that’s neat that your husband was at TEDS. It is a wonderful school. We did not book any formal tours. We planned our own trip for the duration of our stay. I had experience in the area having studied there for a semester while in college. For those who have no prior experience in Israel, I would certainly recommend checking around for some good local guides and formal tours. I just don’t have any specific ones to recommend. I have found TripAdvisor to be a good starting point for searching for tours like that. Hope that helps! Mila, I’m so glad you found the post useful! I just looked at your post and it appears that you had a wonderful time. I’ll bet that was nice to have friends in the area to stay with. You’re right that Israel has a little bit of everything: mountains, desert, cities, green preserves, etc. May your future travels with little ones take you far and wide!